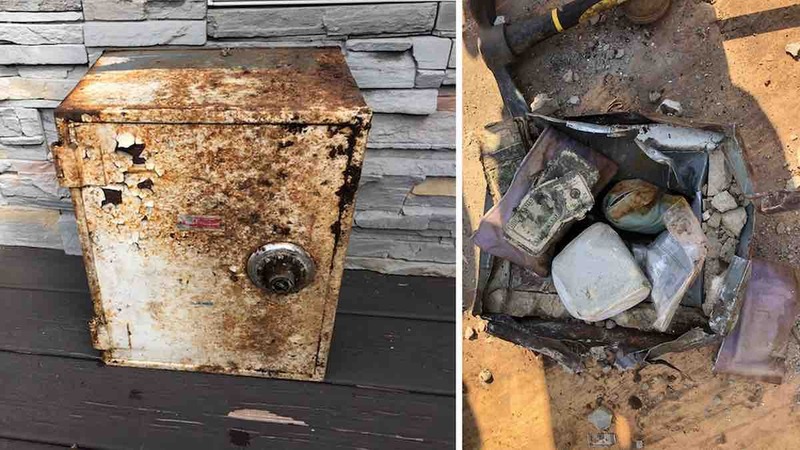 Most people tend to associate buried treasure with pirates and fairytales – which is why this New York couple was flabbergasted to find themselves in the possession of a rusty old safe containing roughly $52,000 in cash and valuables. Additionally, the safe had been sitting in their backyard for years. Matthew and Maria Colonna-Emanuel of Staten Island had always known that there was a metal box hiding amongst the foliage in their backyard, but they had assumed that it was just an electrical box of some kind. Recently, the foliage had been chewed away by wildlife, so they hired a landscaper to replace the greenery. It was then that the landscaper found the box, hauled it onto the couple’s porch, and found that it was actually a 100-pound safe. Matthew and Maria pried the safe door open and were shocked to find that it was filled with cash and priceless gems. Since the safe’s contents had become smelly and dampened by their years spent in the garden, the couple peeled apart the $100 bills to dry. They then found a piece of paper with their neighbor’s address written on it. Matthew went over to their house, knocked on their door, and asked if they had ever been robbed – and they said that they had been. According to the NYPD, the neighbors had filed a report for a stolen safe back in 2011 that had contained $52,000 in valuables. Officers also told the neighbors that they would most likely never see their property ever again. Maria and Matthew then gave the safe to their neighbors who were “shaking” with emotion over the return of their nest egg. Though Matthew says that they have not been rewarded for the safe’s return, they say that they are happy enough to enjoy their “good karma” for the deed.